* Note: Today marks the 100th anniversary of the 1918 fires. Duluth News Tribune and re-printed in my book, Cooler, Near the Lake. 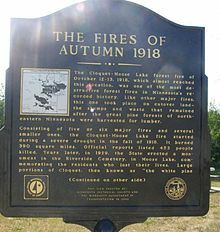 Today marks the 70thanniversary* of the great Cloquet fire that burned much of Northeastern Minnesota and killed hundreds of people. The ranks of those who remember it first-hand are getting thin, although there are still plenty of people in their late 70s and older around to tell about it. Mention of the Cloquet fire brings vivid memories to me. While I missed it by more than two decades, my mother, Ruth Carlson, was age 19 and not yet married on that Oct. 12, 1918, and talked of it often when I was growing up. Everybody who was in this area then had a story to tell about that terrible day. Many have passed the stories down through their families. This is my mother’s Cloquet fire, as she told the story often, once, a couple of years before she died in 1983, into a tape recorder. They say that to a foot soldier huddled in a foxhole in combat the war is only as big as that foxhole. So it is with witnesses of cataclysmic events. We only see a small part and only after they are over do we learn of their scope. My mother’s Cloquet fire story started in downtown Duluth and ended in her home on Piedmont Avenue between Third and Fourth streets in the West End. Here, in her words, is the way it was–for her. “It was a very lovely sunshiny day. It was a Saturday and I had baked several loaves of bread. My friend and I went downtown in the afternoon to look for a birthday gift for another friend. We left about 2:30 and went to Wahl’s store, which was George A. Gray Co. then. “(After shopping) when we came out on Superior Street a terrific wind was blowing and it was very dark. We boarded a streetcar and coming up Piedmont Avenue we met trucks with people on them screaming. Balls of fire were rolling down the avenue, paper and other debris burning. We were frightened and hurried to our homes. (At that point) we hadn’t heard what had happened. “The wind was so strong you could hardly breathe. I got home and my family was very excited. My mother had died in April so it was my father and five (younger) sisters wondering where to go. People were driving down Piedmont Avenue in trucks and cars, screaming. They had been picked up in Hermantown where everything was on fire. “Soon a friend of ours called and told us to pack clothes and a little food and be ready to flee down to the bay because Duluth was surrounded by fire and (he said) the bridge crossing to Superior was burning. The Woodland area was also burning. A neighbor came over crying and wringing her hands because her three children were visiting in Lakewood with their grandmother. She didn’t know if they were alive. “Then we heard they had ordered the people from Twelfth to Tenth streets and the area all around there to vacate. There was so much smoke we could hardly breathe. The rooms were filled with smoke. They called my dad and asked if he would take the grocery truck from where he worked to Hermantown to pick up people. He couldn’t leave us alone. “(Later in the evening) my younger sisters were sleeping and my dad and I were up watching. About 2 o’clock in the morning the wind died down. We were saved–how thankful we were. My friend and I walked up to Hermantown the next day. What a sight we saw–people weeping standing in front of ash piles that had been their homes…so much sickness,too…the people were dying from the flu. (The fire occurred during the great Spanish flu epidemic.) It was not a pretty sight to see beautiful trees and vegetation all black, but the people were brave and went back to their small farms and started to build again. It was some time before he could determine his own parents and siblings back in Duluth had survived, and most of Duluth itself had not burned. and reprinted in the book by Jim Heffernan, Cooler Near the Lake (2008). * To learn more about the 1918 fire... click HERE, HERE and HERE.